I’m a mama’s boy, no doubt about it and proud of it. I was and am lucky that my mother was only 19 when I was born and we got to “grow up together” (her quote). 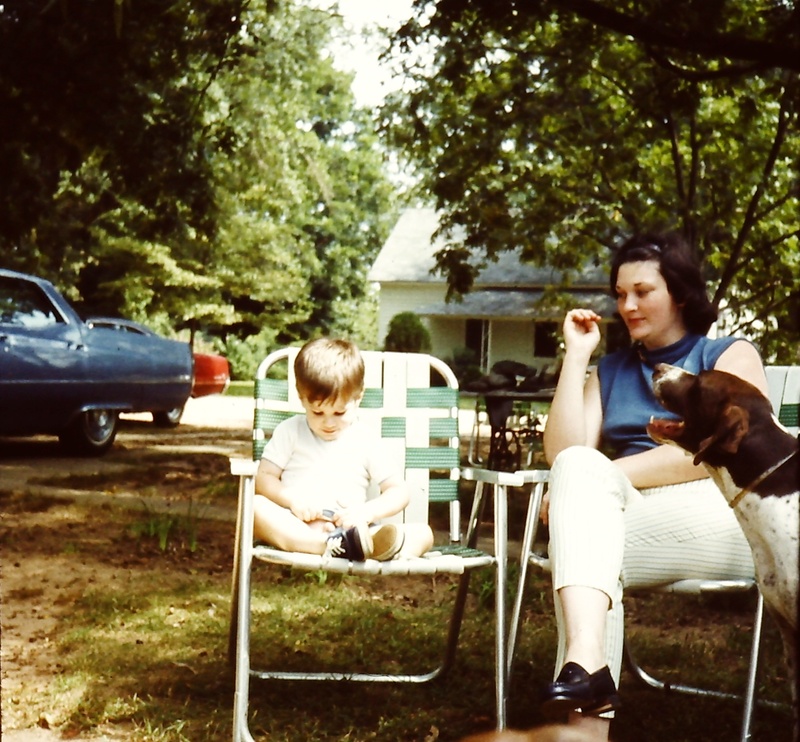 She was always a little different than other people’s mothers in my eyes….she was young and energetic when I was still young and energetic (I’m still young but where did the energy go? ), she drove insanely fast automobiles and can still speed shift her Z3 roadster through all five gears fast enough to give you whiplash (and how many people can boast that their 63 yeard old mother won a trophy for drag racing just a couple of years ago?) and she could make anything out of nothing, and I mean just plain junk. She and her best friend won so many awards for flower arrangements that the local Garden Club won’t let them compete anymore. When I was a kid, one of my memories of her was when we went to pick up her ’78 Corvette from the shop after Dad had wrecked it. There was the long stretch of road and she and my father ended up drag racing his car and her car, Chris in the car with him and me in the car with her, over 100 mph down this road (sorry DFACS, too late to do anything about it now). She has always enjoyed fast cars and passed this insanity on to me. In her early 50′s, she bought a BMW Z3 Roadster, totalled it, bought a faster one and joined the Atlanta Z3 Club. We go to the BMW Performance Driving Center every year and put the cars through the paces and I am ashamed to admit that she can still outdrive me in slalom, speed shifting and figure eights. Speaking of 8, I remember my 8th birthday when she took me to a bicycle shop in Atlanta and let me pick out a bike for birthday. It was a bright yellow Schwinn bike but she made them put this wire basket on the front of it for me to carry things in. Turns out, it was also so she could send me up to Jones Brothers for milk and bread and things when we ran low too. Over the years I’ve had a lot of good memories of my mother to save up and enjoy and even though I am well into my adult years now, we still have a very close relationship because she will always listen to me and let me vent and fume about things and listen to my jokes and I know she secretly laughts at the irreverent things I say sometimes. She still enjoys making things, all kinds of crafts and being a creative person. She always wanted to be an architect and I remember well how she used to arrange furniture in our house. She had drawn a scale diagram of each room in our house and had made cuout furniture pieces to exact scale and before she would move a single thing, she would arrange furniture on this diagram, moving things this way and that until she had it exactly like she wanted it-then she would call the guys in and we would all move the furniture, one time only and it fit perfectly and looked great where she had it placed. She passed on her love of architecture to me and I spend a lot of my downtime designing homes and landscaping, now on a computer of course. She enjoys cooking and even though half the stuff she experiements with doesn’t sound good at all to me, it always tastes good. She makes a lasagna that is so good that only one time in my life have I found any that was better and this made by an Italian in a true Italian restaurant in New York City that tourists have never heard of. She knows how to fish, how to shoot a gun and how to do complex math without a calculator (apparently Mrs. Prosser was an excellent math teacher)…..and she can grow anything, in any kind of soil. Finally, I would be remiss if I didn’t mention what a wonderful mother my wife is to our son. I fuss at her sometimes for spoiling him but she is the best and most attentive mother a son could have and I hope he realizes how lucky he is and how much his mother loves him. Being a mother completes her and she tackles the job with the same gusto that I tackle a catfish at Bill’s. Here is to all the moms out there on your special day….Happy Mothers Day!